The rooms didn't have tea and coffee maker. No mini fridge also. Thier reseption close at 12 pm which something made me feel bad as I arrived at the hotel 3 am , so we have to knock on door to wake up the reseptionist. the bed was firm and comfortable, buffet breakfast delicious, great location near ave. bourghbiba, and staff very helpful and friendly. highly recommend! The location of the hotel is perfect as it is within walking distance from where we had to go to work as well as the medina.The street in which the hotel is located is not great. The location was great. Very close to the Medina entrance, but also near the main square and all the wonderful restaurants in Tunis. Staff was helpful and breakfast very good. 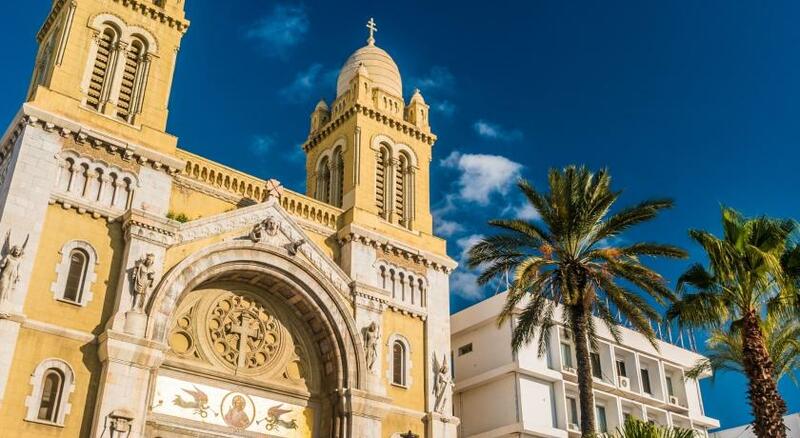 The location is great, as it’s situated in the heart of Tunis downtown only few meters from the main street full of shops, cafes and restaurants, and not far from the Madeina. I liked everything. The building is new, with lift to every floor. It’s very clean, rooms are very comfortable. I had a single then a double with my daughter and both were flawless, great beds and bathroom. Personnel in reception were very helpful, they helped us to do and print the check-in in their computer. Breakfast had eggs, cheese, vegetables, cold meat, cereals, croissants, bread, butter, jellys, etc. 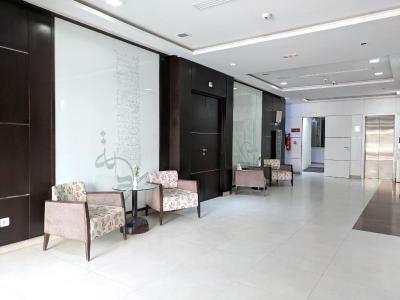 Location is terrific, downtown with lots of modern cafes and shops, and 7 minutes walking to the medina. Hotel Tiba This rating is a reflection of how the property compares to the industry standard when it comes to price, facilities and services available. It's based on a self-evaluation by the property. Use this rating to help choose your stay! 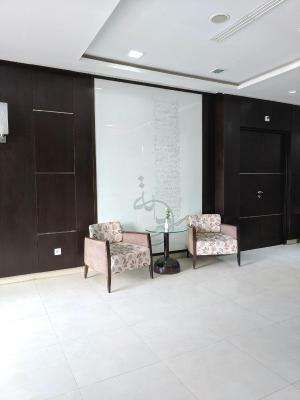 Hotel Tiba is located in Tunis city center, just a 1-minute walk from the theater and a 5-minute walk from the medina. It offers a 24-hour reception. The air-conditioned rooms and suites at Hotel Tiba are decorated in a modern style and include a TV with satellite channels. All rooms feature an private bathroom and some also have a balcony. A buffet breakfast is available every morning in the dining room or in the comfort of guest rooms. Free Wi-Fi is also provided. Private parking is available at this hotel at an extra cost. Tunis' Barcelone Train Station is a 5-minute walk from the property. When would you like to stay at Hotel Tiba? 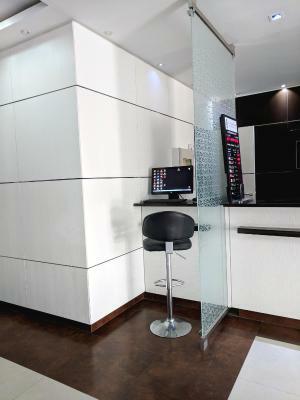 Decorated in a contemporary style, all rooms feature free Wi-Fi access and a TV with satellite channels. There is also a private bathroom with free toiletries and a hairdryer. 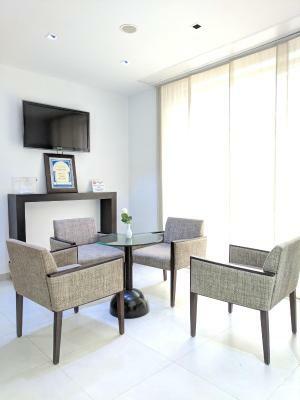 Decorated in a contemporary style, all rooms feature free Wi-Fi access and a TV with satellite channels. There is also an private bathroom with free toiletries and a hairdryer. Extras in the spacious suites include a living room with sofa. Hotel surroundings – This neighborhood is a great choice for travelers interested in beaches, food and museums – Check location Great location - show map Guests loved walking around the neighborhood! House Rules Hotel Tiba takes special requests – add in the next step! Hotel Tiba accepts these cards and reserves the right to temporarily hold an amount prior to arrival. That we dod nt understand the time as we had a very early flight . Fresh fruit for breakfast and a kettle in the room for making a cup of tea would be really good. Everything was really excellent, but would be good to have some fresh fruit for breakfast. i stayed in this hotel 3 times before, this is my first time with a car, it says in Booking.com that there is a parking! but unfortunately there is not, I had some troubles finding a parking space but the staff were very helpful. Breakfast needs to have some variety. At checking out, I noticed that the rooms number (213 & 203) were not indicated on the final Invoice and asked for the rooms numbers to be be shown on the invoice. I had to make effort to convince the staff at the reception desk to write it with a pen and have it stamped for each room. They told me that it is not in the system. IT IS VERY IMPORTANT FOR ME TO SHOW CLEARLY WHICH ROOM I STAYED IN. IT IS MOT ACCURATE JUST TO SHOW TGE DURATION OF MY STAY AT TGE HOTEL"TIBA" WITHOUT INDICATING THE ROOM NUMBER. If I felt uncomfortable with their response. The breakfast did not give enough time for me as I am late sleeper so I went on without it. The rooms were super dirty starting from hair in the bathroom and on the bed! it looked like nobody had cleaned it for ages! Also curtains were broken and shower was in bad conditions. Location was good as access to the Medina and breakfast was ok.